As I am going through some mild depression, I changed my shrink hosting site and I moved to a new blog chair with a different focus–not all about cancer. 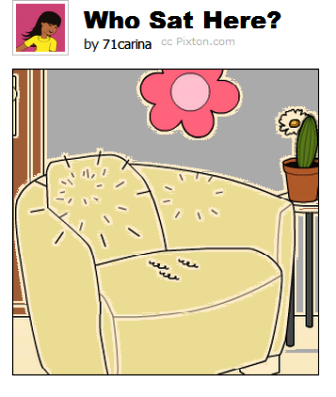 Come visit me at my couch Carin’s Gratitude. It's true, it's true. I have it. Do you? Let's find ways to cope with it. If we can inject fun along the way, why don't we? Slave to an 8-lb poodle and 2 teen people. Intensive Care nurse. Soulmate to P. Friend to great supporters. Related to many out-of-state loved ones. Cancer stats: Breast cancer warrior in remission who beat Infiltrating Ductal Carcinoma. Diagnosed on Nov '11 at 40 from 1st routine mammo. Stage 1 Triple negative. 0.6 cm tumors on right. Elective bilateral mastectomy. Immediate DIEP flap reconstruction. Adjuvant Taxotere/Cytoxan chemotherapy 2012. Baby haired with a wig, hat, or headband. 6 relatives with history of breast cancer. BRCA mutation -, some relatives +. ↓ 2017→ The Year I Will Say "Bye to Breast Cancer"
O great St. Peregrine, you have been called "The Mighty," "The Wonder-Worker," because of the numerous miracles which you have obtained from God for those who have had recourse to you. But who is more powerful than God? Wildest Roller Coaster Ride Music video on emotional reality of BC. Ellen on Breast Cancer Awareness I laughed and cried on this video clip. Laugh With These BC Deaf Ladies These BC Survivors sign (language) on the funny side of BC. Man Needs to Check for BC Too This video ad made me laugh. Stage 1 Breast Cancer by Carina is licensed under a Creative Commons Attribution-NonCommercial-NoDerivs 3.0 Unported License. Permissions beyond the scope of this license may be available at 71carina@gmail.com.